After morethan four hours of running in place, NASA astronaut Sunita Williams completedthe Boston Marathon while orbiting Earth aboard the International Space Station(ISS). "Hooyah, I'mdone," Williams cheered as she passed the orbital finish line on the spacestation's treadmill. Williams,41, began running the marathon at 10:00 a.m. EDT (1400 GMT) as the race kickedoff in Boston and the ISS circled Earth at some 17,500 miles (28,163 kilometers)per hour. "It'scoming up on 9.5 miles and it looks like we've gone around the world," Williamssaid about 90 minutes into the 26.2-mile (42-kilometer) race. "So that's prettycool. A nice statistic." 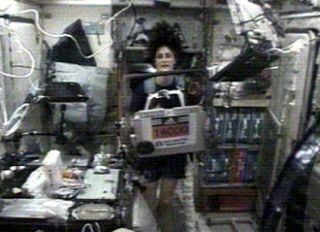 At about2:24 p.m. EDT (1824 GMT) she radioed to Mission Control that she'd completedthe race with an unofficial time of about four hours, 24 minutes, marking thefirst time an entrant has competed from orbit. A native ofNeedham, Massachusetts, Williamsgrew up in the Boston area and participated in Boston Marathon once before as ateenager. She qualified for this year's race during the 2006 Houston Marathonwith a time of three hours, 29 minutes and 57 seconds. The Boston AthleticAssociation issued her the bib number 14,000, which Williams taped to the frontof her treadmill, for Monday's event. "I thinkthe idea came up because I'm a big proponent of physical fitness and I justwanted to make kids aware that it is a necessary part of your life," Williamstold reporters last week during a video interview broadcast on NASA TV. "Ithink if I could do something up here to show kids that it's fun and it'simportant, than maybe somebody will get off the couch and start working out." Unlike herterrestrial counterparts, who braved strong winds and rain to complete the coursein Boston, Williams stayed high and dry. She ran a steady six-mile(9.6-kilometer) per hour pace on a treadmill inside the outpost's Russian-builtZvezda service module while orbiting about 210 miles (337 kilometers) aboveEarth. Theastronaut lauded Kenya's Robert Cheruiyot and Russia's Lidiya Grigoryeva, whowon the Boston Marathon's Men and Women divisions, respectively. Cheruiyotfinished with a time of two hours, 14 minutes and 13 seconds, while Grigoryeva completedthe race in two hours, 29 minutes and 18 seconds, according to the BostonAthletic Association. "Incredible,congratulations to all those folks," Williams said of the marathon winners. "[Thosewere] pretty horrific conditions and those are some great times." Williamssaid that while she wouldn't experience some of the tougher parts of themarathon's terrestrial course, such as Heartbreak Hill, running on the spacestation's treadmill - known technically as the Treadmill Vibration IsolationSystem (TVIS) - is no picnic either. The exerciseequipment features abulky harness and bungee cords to hold weightless astronauts in place whilerunning, and can prove painful on the shoulders and hips during long treks, shesaid before Monday's race. It has also experienced technical problems in thepast, but performed admirably during Williams' four-hour run. "The thingheld out like a champ, no problems, no faults, no nothing," Williams said ofthe station's treadmill, which has acted up in the past. "It's a great piece ofgear." On Earth,Williams' fellow NASA astronaut Karen Nyberg completed the Boston Marathon in threehours, 32 minutes and nine seconds. Also running the race in Boston wereWilliams' sister Dina Pandya, flight surgeon Steve Hart and long-time friend RonnieHarris. Otherfriends and supporters were expected to cheer Williams and her fellow marathon runnersfrom a vantage point between the race's Mile 14 and Mile 15 markers, signifyingthe spacestation's ongoing crew change between Expedition 14 and Expedition 15, theastronaut has said. Williams joined the space station's Expedition 14 crew in December2006, and will stay on for the first stage of the Expedition 15 mission. Williamsran the Boston Marathon as many of her fellow crewmembers slumbered aboard thestation, though Expedition 14 commander Michael Lopez-Alegria and Expedition 15flight engineer Oleg Kotov prepared drink pouches and orange slices for herduring the race. "She has myundying respect," Lopez-Alegria said after Williams completed the marathon.